Retail Price: $19.98 Log in for LOWEST PRICE! Back in 1973, Beverly Hills developer Herman Schwartz became enthralled with the rolling hills of Paso Robles. Based on the success of a small winery just to the west of his property, he decided to plant grapes there. To everyone's surprise but his, Continental Vineyards became one of the most prized vineyards in the Central Coast. He was even known to sell grapes to wineries in Napa and Sonoma, but none of them would admit that. That vineyard is now called Broken Earth and is the maker of our Monrovia Station selection. The vineyard is currently more than 500 acres, spread across several patches of land in order to make the most out of each parcel's unique soil, sun exposure and micro-climate. While several people mind the vineyards, only one man makes the wine, Chris Cameron. He has won so many awards and accolades that when you ask him about them, all you'll get is his infectious smile and maybe a nod. He lets his wines speak for themselves. Our selection speaks loud and clear. This is basically a Bordeaux blend of Cabernet Sauvignon, Merlot, Malbec and Cabernet Franc. Cabernet Sauvignon makes up the majority of the blend and shows in the power and presence of this selection. 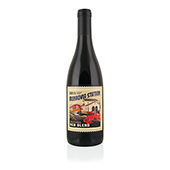 The black cherry and currants are evident in the playful nose and arrive on stage front and center on the palate. Flecks of earth and plum also present themselves just before the whirlwind finish.